The Stringfellow Superfund waste site is located approximately 50 miles east of Los Angeles in southern California. The site includes a former Class I industrial waste disposal area that accepted industrial wastes from 1956 to 1972. Monitoring of the site includes over 400 monitoring wells, over 300 domestic wells, and over 1,000 locations made up of borings, CPTs, process measuring points, and other locations. There have been over 250,000 sampling events to date, resulting in over 3 million sample results and over 300,000 process data points. Tetra Tech has been successfully performing services for the California Department of Toxic Substances Control (DTSC) at the Stringfellow Site since 2002, including data management, GIS, modeling, and production of annual reports. Previously, access to maps of the Stringfellow site was restricted to those having access to a GIS system installed on their local machine, as well as to the data files. DTSC tasked Tetra Tech to create a web mapping system (called the LIMSMAP Viewer) to allow more users to access and view a subset of the data contained within the large Stringfellow database. A web-based viewer was created and customized using Apache Flex; the basemap data were created in ArcGIS Desktop, loaded to an ArcGIS Server, and made available as optimized services. Users have a choice of basemap layers to display, including aerial imagery, roads, zone boundaries, parcel information, geology, and chemical plumes defined in previous years' annual reports. Queries based on ID, type, zone, and waste stream can be run, displayed, and zoomed to on the map, and tabular results (including additional data) can be viewed on-screen or exported to an Excel document; graphical and spatial selections can also be made. 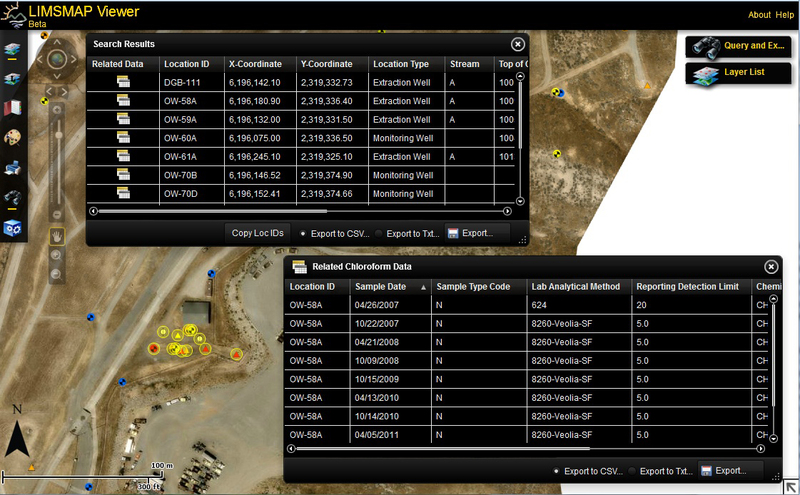 In addition, the ability to query groundwater chemistry and elevation data associated with specific sample locations has recently been added. Future improvements to the website include directly linking boring logs/well construction diagrams to mapped locations. Based on the Stringfellow LIMSMAP, an additional web mapping application specific to the BKK Landfill Superfund site (an additional, separate DTSC Superfund site located approximately 20 miles east of Los Angeles) has also been created.